← The Grace of Gathering. I had started to write a lighter hearted blog, when events in our country took the shape they did. There is absolutely no way I could proceed with the old blog when so many of us are full of anguish. The death of Reza Berati, brutally murdered on Manus Island, has touched into so many hearts because he had a name and a photo.The people who contacted Australians to let them know what was happening would have to be the most courageous people we know. To risk any shred that could have been left of their personal safety and future security for the good of the whole, is what it takes for them to be in the company of extra-ordinary human beings. They are in the ranks of heroes now, people we aspire to be like. We can never thank Asylum Seeker Resource Centre enough, for sharing Reza’s name and photo with us. They gave him a name and a face, made him a person to us, and his individual identity now has a strange sort of existence in the country he longed to reach. Prejudice changes, or even willing hearts are moved, when people see for themselves that this could be someone they know and love. For us, Reza could be our grandson or any of his friends. They are in the exact age group, they look similar, they are young men who care about life, and play sport, have dreams and ambitions and girlfriends.They watch the soccer together and go to the beach. We love the noise of their laughter and chiacking, just like Reza’s family loved his. We love their tenderness and their gentleness and their good manners around the grandparents. To imagine any one of them killed in the way he was, is almost too hard to imagine – but if we can’t face imagining it, what is it going to take for his family – already part of a persecuted minority – to absorb this? where can hope ever lie for them again. Of course it is worse than that. It was not just the ugly and terrible death of one young man. As the hours have passed, layer upon layer of horror has emerged. We try to imagine what it would be like to be running in the dark trying to find a place of safety but hemmed in by fences, as people tried to smash us to death like vermin. We try to imagine the frenzy of brutality and blood, the fear pounding in hearts, the screaming to no avail, the distress of the ones who could not help and were trying with shaking hands to contact the outside world. And then we had try to absorb the depth of the complicity of our Government – our country. We listened with disgust as they still tried to lie their way out of such a happening, as they even tried to blame the refugees for causing it. Revelation after revelation could not be denied, until we added up the bleak, terrible and disgusting picture of what was trying to be hidden. We were outraged at the lies and of the deeper truth they revealed, of how deliberately the conditions were made to break people. It was not just a by-product of the conditions, but the purpose of them. We were shocked that our country, could be changed so rapidly and with such precision and planned attack on the values we thought were immutable. We all knew that both sides of parliament were a bad bet for refugees after the election, but no-one expected what has taken place in our once-democracy, nor the determination with which it happened. We have been caught in the headlights like rabbits at the crossroads, unable to think or plan clearly, or to find a way to do anything at all to change it. Devastatingly, it has brought to this cushioned generation hard knowledge that was already known by others. Aboriginal people in Australia suffered and still suffer similar fates today, but they pass almost un-noticed. I don’t think they would have been surprised. Our history, both recent and the little further back that white settlement goes, contains so much ugliness we would rather gloss over or forget: wealth and privilege are built on exclusion, ill-treatment and the backs of others. Australia is no better than anywhere else. Australia has a surface that is attractive, but if you break through the crust, underneath you find violence and cruelty. If you think that is too hard to stomach, just try living on the underside for a week or two. There is beauty and life to be found, and there is human community, but it all takes constant vigilance. It is not something to be taken for granted. The powerful and greedy do not easily give up their power or wealth. Former Prime Minister Malcom Fraser, has warned that the secrecy and arrogance and changes to our laws, are a setting for tyrrany. We are all left wondering just how far this can go. So many friends who have been supporters of justice and fairness as a way of living, have expressed their depression at the humiliation of being part of this country now. Too many are feeling overwhelming sadness. Last time (oh, how we thought we would never have to say that!) we had the Tampa and the ‘Children Overboard’ as key turning points where people came together and began concerted community action that eventually saw many refugees resettled here to become citizens of great worth, even as they carry their wounds. It is not lost on us, that the way we came together then to support refugees was studied – and used as a tool to prevent us finding it easy to repeat our strategies. This time, be on notice Prime Minister, we have reached the tipping point again. 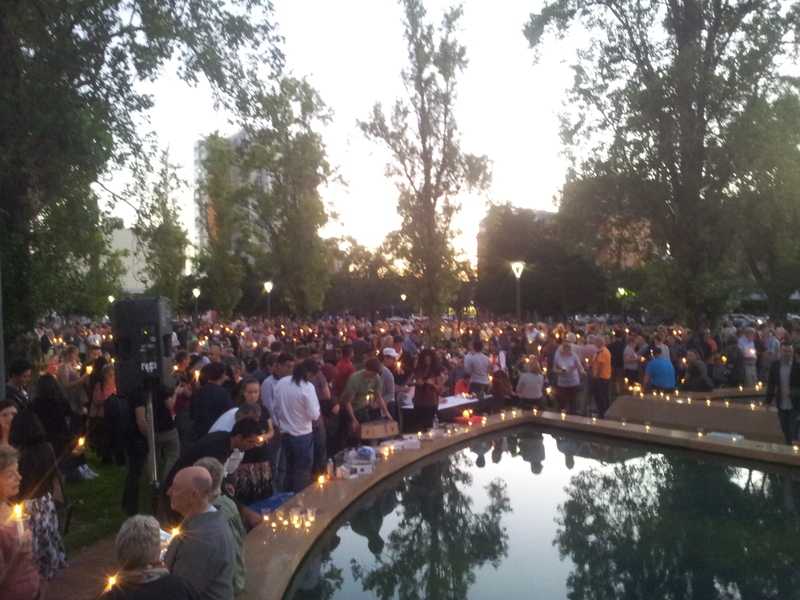 The response to the #Light The Dark vigils for Reza Berati were the visible demonstration that the Australian people are not going to let this continue. We have lost our innocence and gained our strength. We will march and be heard again and again until you understand that we will not tolerate it. We know we can be far, far better than this. We came and mourned as if it was the death of our own brother, son, grandchild, friend. We also mourned the passing of what has been taken away from us – our pride in our country. For each who was able to attend at such short notice , there were fifty or a hundred more who felt the same. We came and mourned but we found strength when we found the others who shared the time with us, both known and unknown. 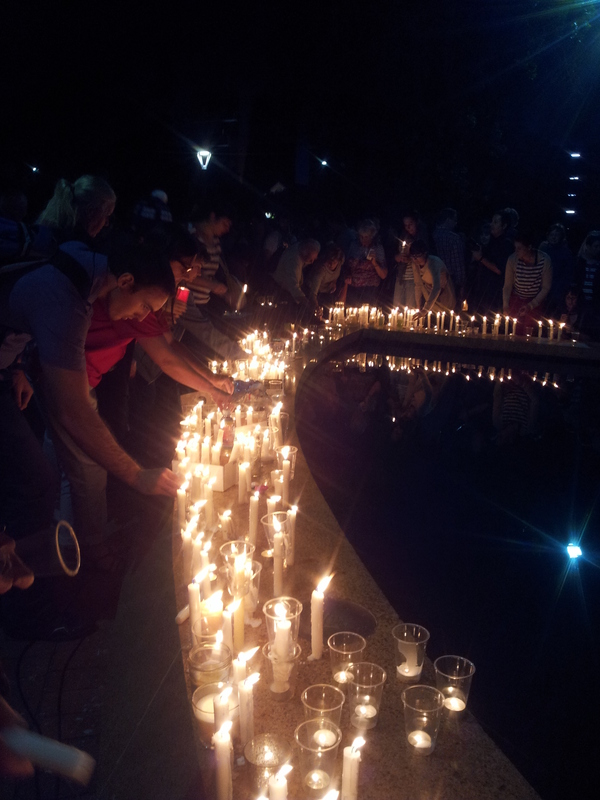 We left our candles to glow in the darkness, and it soothed our hearts to do it, but candles can’t do it on their own. The critical element for the future is what we will all do next. Acting together is the only way we can find our way to hope. In every way we can say it, we each must take the responsibility to say ‘Enough!’ because together is the only place that little feathered bird will still have a chance to sing. 3 Responses to The Song Of The Feathered Bird.